This week's creative space is feeling distinctly un-creative just now. In the background there, you can see lots of cut pieces for a trial-run of my first shirt, McCalls M5522, View D. And I know its about to cause me grief; lots of it. You see I've reached a point in my sewing where my ability to alter patterns is lagging behind my ability to construct garments. I would love to make lots of shirts, jackets and trousers, but sadly there is little point unless they fit nicely. And for someone of the full-busted-sway-backed-protruding-tummy-you-really-need-to-stop-slouching-like-that persuasion, there's a lot of altering to be done. Ah, I know that place well. Maybe we could think up an elaborate plan to kidnap Sue and keep her as our pattern altering slave? Keep on keep on. 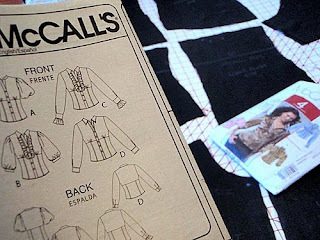 You'll be a pattern altering champ in no time. Wishing you lots of luck with it. I have every confidence you'll get it and be a master before you realise it, probably long before you realise it. It won't happen until you start cutting though - so stop watching and get to it! I'm with Kirsty, keep on at it. You'll get there. Love that photo from Tuesday night, by the way. What a stunning sky. Oh pattern altering is the worst, it's so bloody ongoing. Hoping you have a magical pattern alteration break through. Yes, it is hard. The only short cut (and it's not that short!) is to pay a pro to fit a handful of patterns on you. Things with a basic fit that you can then add style details to (collar, sleeve length, pockets etc) make it your own. Otherwise - toiles are your friend (UK term for muslins) and there is truly no such thing as a 'wearable muslin' if you doing it right the calico will have red and blue pen and holes and pins and sticky tape all over it to become your new altered pattern. I hope it went (or is going) well!